Command Prompt cmd.exe not receive all paste commands! QuickTextPaste is designed more for text editors, Office programs, or to run and start programs, optional with arguments (parameters)! Maybe: ► ... Command Prompt alternative ColorConsole! 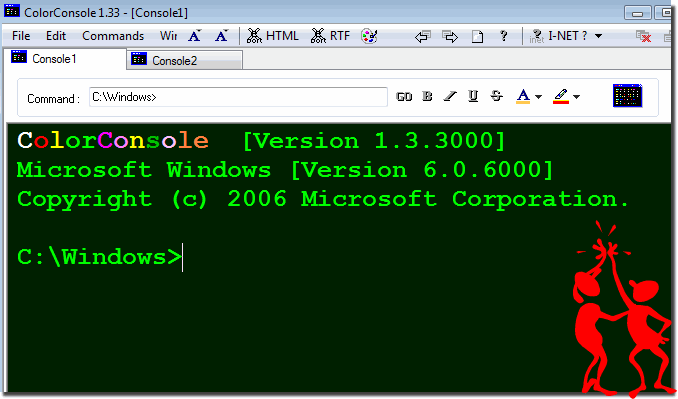 Color-Console is a good alternative to the standard Windows operating system console. The program has a nice interface, there are customization of fonts and background! Suitable to be able to deal with the commands. However, requires the knowledge of an experienced user to use it effectively and correctly. (Image-1) Windows Command Prompt cmd.exe alternative! QuickTextPaste - FAQ-26: Command Prompt cmd.exe not receive all paste commands! Activate the Auto Backup Feature in QuickTextPaste! How to see is it an important Windows Hot-Key, not occupied or in use? I'm looking to install your program on multiple computer? Portable use and Windows 10 protected folders problem!